Home » Misc Frantery » Glow-in-the-Dark Sushi? 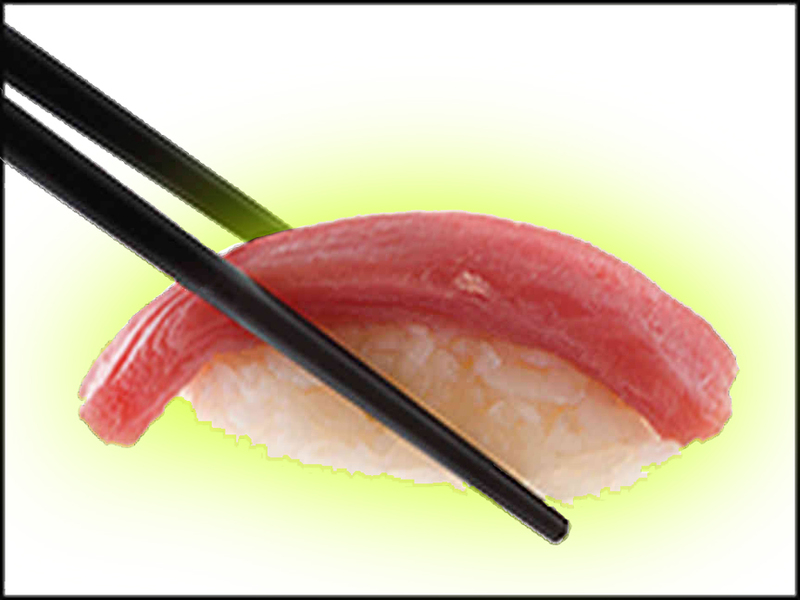 Aieee, I went to eat sushi last night and I have to admit, I was peering at the tuna anxiously for signs it might glow on the dark if they turned out the lights. After reading that tuna being caught off the coast of California were all tainted with radioactive Cesium from the Fukushima Dai-ichi meltdown in 2011, I was kind of worried. To eat, or not to eat? News reports said that tuna caught all the way across the ocean from Fukushima were contaminated with ten times more radioactive Cesium-134 and -137 than before the Fukushima Dai-ichi nuclear plant meltdown in 2011. There’s no doubt that the elevated fish radioactivity is a result of growing up in the reactor meltdown water that barreled into the ocean after the 3/11 tsunami – they tested tuna from the Atlantic Ocean and tuna that had migrated to California before the 3/11 earthquake and didn’t find any Cesium at all. So now the release of radioactive water (that is still leaking into the ocean from the damaged reactor, according to this weeks’ additional outraged headlines) is contaminating the food supply beyond Japan. Aieeee! Do I have to give up tuna forever? Nooooo! Taking this to the logical next step, Forbes magazine was inspired to publish an article countering the eco-warrior spin on the hot fish news, quantifying the entire Fukushima radioactive water leak crisis in terms of bananas. 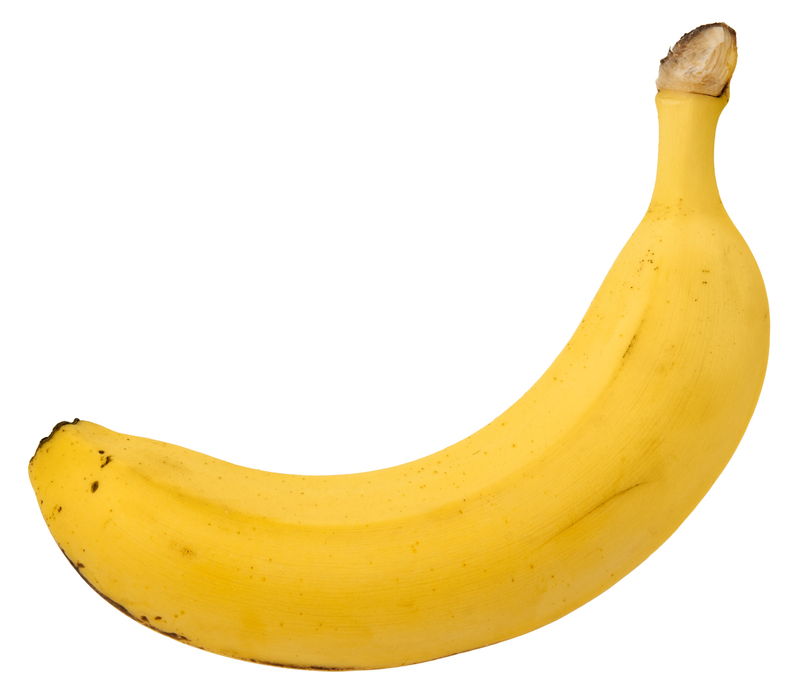 Apparently, the Fukushima plant has dumped 76 million bananas-worth of radiation into the Pacific. Whew. So it’s not really that bad, right? Tra la tra la, pass the soy sauce! First of all, the fish they tested were two to three years old. They’d been majorly dosed with radioactive water from the initial meltdown in their formative years, then they grew somewhat less radioactive as they got bigger and migrated to untainted parts of the ocean. Also, the Cesium-134 lodged in their tissues has a half-life of 2.0652 years, so it decayed somewhat from the time the fish were originally contaminated. 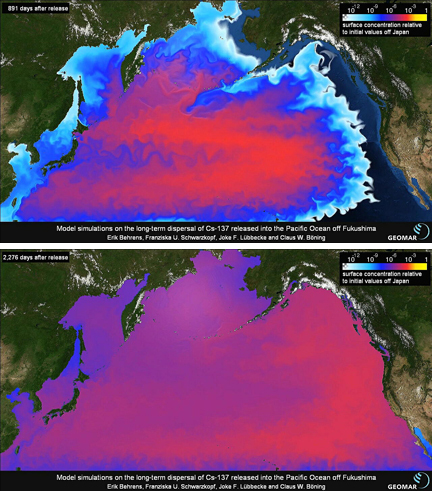 But what will happen when the plume of radioactive water that’s still leaking into the ocean from the damaged Fukushima reactor at the rate of 300,000 litres a day spreads throughout the Pacific, like these maps predict? 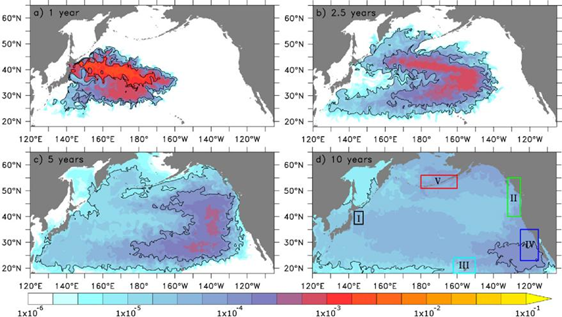 So, what will happen to my future sashimi if radioactive water continues to sluice into the ocean from Fukushima Dai-ichi, adding to the plume from the earthquake that’s spreading across the Pacific? 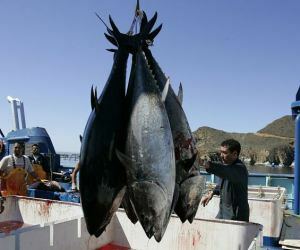 What if the tuna are exposed to radiation their whole lives, not just near Japan,where they hatch? I guess we’ll find out when the results of a study planned for this summer come out. Researchers are going to measure the levels in fish that have been more constantly exposed to radioactive seawater their whole lives. In the meantime, I wish the Japanese government would stop concentrating so hard on luring the 2020 Olympics to town, and more on getting Fukushima Dai-ichi shut down and cleaned up for good. Because come on, guys, I don’t look good in lead. “liked and not liked!” As a gluten-free/vegan I was perfectly happy until the banana! Yike! We’re all going to be glow in the dark! I think I’m already lighting up the night, since I’ve eaten a TON of bananas in my life! An excellent commentary, Jonelle. I wish the NYT or other major media would pick it up as a guest editorial. I’m gonna share on FB and among friends in email. Thanks for your perspective on some majorly scary stuff. I’m so happy to hear it helped make a little more sense of this wildly spin-massaged situation! This is one of those news items just asking to be used as fodder on the electronic soapbox, and even though I applaud those who want to use it to put pressure on the Japanese government to do something about the shameful Fukushima Dai-ichi leak, I hate it when truth gets stretched so far it can be dismissed by those in power as propaganda. That hurts more than it helps. I like that we’ve connected Jonelle! If you come through San Francisco again, definitely hit us up and come by our studio/workshop/factory space. Likewise, on the connection! And actually, I’m in SF right now, until November 1st. Am supposed to be chained to computer starting Book #4, but am always looking for righteous procrastination. Checking out the Holy Stitch Denim Social Club just shot to the top of my list! Will beetle over to your website and see where you’re at. What will Book #4 be about? That sounds incredible, #4. Would love to pick your brain about life as a writer, and publishing in general. Book #4…good question! （ﾟдﾟ);; Working on that now, as a matter of fact! And I love to have my brain picked about The Writerly Life, so ask me anything, anytime!